Here is another in a series of at-the-brink, sun-is-setting articles in the China Daily and other Chinese publications. All the familiar hallmarks: rising labor costs, inputs goods inflation, transportation disruption and other Mad Max conditions. The lights could actually go out and factories could be permanently shuttered all over China’s export sector after the Chinese New Year [Labor Shortage as Migrants Quit City]. 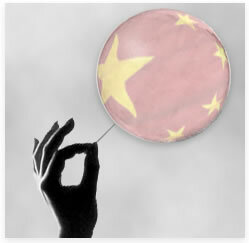 International Economy offered a publication from thirty “experts” on the question: “If the Chinese bubble bursts.” In most cases these were treated as possibilities not predictions. In my case, these are predictions. I offer some of their pertinent comments, as well as point out the weaker offerings. Case in point: Writer Steve Hanke (page 25) points out China’s “problem” of 64 million empty housing units and admits that the property bubble is a whopper. Supplying the big number himself, he goes on with counterintuitive and non-factual comments that the excess is contained to four first-tier cities and involved only 3% of total floor space constructed in 2009. Let’s see if I have this straight: 97% of the floor space that led to 64 million vacant units is outside those four large cities, but those other localities are not suffering bubbles? According to Morgan Stanley, GMO calculations, the nationwide average of property value divided by disposable income per urban household was 8.2x at the end of 2009. It was 9 times that in Tokyo at the peak of their property bubble. Other measures, such as price to rent, demonstrate that Hanke’s comments are complete nonsense. He goes on to state that their “government” is in a strong fiscal condition to absorb the hit banks will take (8% of total bank assets in his view), and that “banks won’t be allowed to go to the wall.” This is the same argument made globally. Hanke completely failed to mention that debt taken on by local and state government for bubble projects. Analysis by key omission: If this is a professor of economics at a major university, no wonder modern economics has become such a joke. An “anonymous senior Japanese official” (pg. 12) describes the local government’s role. So-called “loan platforms” were established as funding vehicles to obtain commercial loans. When Beijing mobilized a massive 4 trillion Yuan pump priming in 2008, it ordered local governments to bear one-third of the cost themselves, triggering a stampede. As of June 2010, there are 8,221 platforms and their outstanding loan balance was 7.7 trillion Yuan, of which 20% to 25% are deemed “problematic” by the China Banking Regulatory Commission. Hongyi Lai (pg. 17) suggests that under this scenario, “globally, as Chinese urban consumers tighten their belts, Chinese imports will shrink, especially commodities mostly related to construction such as iron and steel, timber, and certain energy inputs. Imports of non-essential consumer items such as personal luxury goods and high-end home appliances will decline. In addition, China’s purchase of overseas financial products and investments abroad may also decline”. Analyst Maya Bhandari (pg. 10) chimes in by pointing out that China is nearly twice as powerful a global growth locomotive as the US. Unlike the other analysts, she states she sees “very little domestic demand growth” even now. Further, China has addressed overheating and inflation by top-down ordering of banks to cease lending. “This is symptomatic of a market economy operating under a communist political structure,” says Bhandari. As a bust develops, many of these economists expect China to try and devalue the RMB to support their old mercantilist export model. This would be met with fresh howls from the US, and might be easier said than done. What China really needs is a large commodity and input goods price correction, and they needed it yesterday. Without it, a RMB devaluation would be even more inflationary for China. Within China, there are those declaring the export, over-investment cycle is exhausted. Writing that China’s growth model has “exhausted its potential,” an influential former PBOC member warns the country faces a sudden economic slowdown. Yo Yongding lists rising social tensions, pollution, lack of social services and an over reliance on exports and investments as key threats. Banning Garrett (pg. 21) writes a good, overall view of the impacts of a China Bust. The key takeaway is that almost the whole world is operating under the assumption that China’s model will continue indefinitely, and the shock effect won’t be pretty. About The Author: Russ Winter has written a blog called Winter Watch for the last three years. Russ also has a subscription service called Winter's Actionables. Dian L. Chu, M.B.A., C.P.M. and Chartered Economist, is a market analyst and financial writer regularly contributing to Seeking Alpha, Zero Hedge, and other major investment websites. Ms. Chu has been syndicated to Reuters, USA Today, NPR, and BusinessWeek. She blogs at http://econforecast.blogspot.com/.